Turmeric : In cultures that are thousands of years old, there tend to be deep traditions of cooking daily meals with medicinal roots and herbs. Turmeric is one such medicinal root that has made its way into many Indian recipes. Research shows that turmeric has powerful anti-inflammatory, anti-tumor, and antioxidant properties. Inflammation, if left untreated, can become a chronic health issue. And unlike aspirin or ibuprofen, turmeric’s curcumin reduces inflammation naturally, without damaging the liver or kidneys. Ayurveda, an ancient holistic system of medicine and natural healing from India, is based on preventive medicine, and this is why you’ll often see a variety of medicinal herbs and spices built right into their daily meals. This includes not only the wonderfully fragrant and flavorful ginger, chili, and cardamom, but also turmeric, which is widely used as an ingredient in the region’s well-known curry dishes. Curcumin is most known for its potent anti-inflammatory properties. The compound has been shown to influence more than 700 genes, and it can inhibit both the activity and the synthesis of cyclooxygenase-2 (COX2) and 5-lipooxygenase (5-LOX), as well as other enzymes that have been implicated in inflammation. You need some level of inflammation in your body to stay healthy. However, it’s also possible, and increasingly common, for the inflammatory response to get out of hand. Inflammatory processes also cause irritation to tissues characterized by pain, redness, swelling, and heat, such as is often experienced by osteoarthritis patients. Curcumin’s anti-inflammatory effects help to reduce these symptoms. One recent study found that osteoarthritis patients who added 200 mg of curcumin a day to their treatment plan experienced reduced pain and increased mobility,i whereas the control group, which received no curcumin, experienced no significant improvements. Other research also found that a turmeric extract composed of curcuminoids (plant-based nutrients that contain powerful antioxidant properties) blocked inflammatory pathways,ii effectively preventing the launch of a protein that triggers swelling and pain. Many patients turn to non-steroidal anti-inflammatories (NSAIDs) and analgesics, like Tylenol, for pain relief, but the regular, chronic use of these types of medications is associated with significant, and very serious, side effects such as cardiovascular problems, gastrointestinal harm and kidney and/or liver damage. Curcumin may be able to provide safe, natural pain relief, provided it is absorbed (more on this later). India has long revered turmeric as “holy powder,” and has used it for centuries to treat wounds, infections, and other health problems. Modern research is now confirming many of its folklore claims, finding an astonishing array of antioxidant, anti-cancer, antibiotic, antiviral, and other properties. A general immune system booster due to its high antioxidant capacity, turmeric is five to eight times stronger than vitamins C and E, and even strong enough to scavenge the hydroxyl radical, which is considered by some to be the most reactive of all oxidants. Can Turmeric Even Help Prevent Cancer? In India, where turmeric is widely used, the prevalence of four common U.S. cancers — colon, breast, prostate, and lung — is 10 times lower. In fact, prostate cancer, which is the most frequently diagnosed cancer in U.S. men, is rare in India and this is attributed, in part, to the curcumin in turmeric. Dr. William LaValley from Austin, Texas is one of the top natural medicine cancer physicians I know and he recently shared this important information with me. Interestingly, curcumin actually has the most evidence-based literature backing up its anti-cancer claims of any other nutrient! Curcumin affects over 100 different pathways once it gets into a cell. Interestingly, this also applies to the metabolite of curcumin and its derivatives, which also have anti-cancer properties. According to researchers from the University of Texas M.D. Anderson Cancer Center, curcumin blocks a key biological pathwayiv needed for the development of melanoma and other cancers. Interestingly, just about every alternative medicine expert I know recommends curcumin for just about every type of cancer as it seems nearly universally beneficial. It is the only supplement that I know of that has this benefit. It is very clear that it will be one of the most widely used anti-cancer nutrient approaches in the future. The formula should be free of fillers, additives, and excipients (a substance added to the supplement as a processing or stability aid), and the manufacturer should use safe production practices at all stages: planting, cultivation, selective harvesting, and then producing and packaging the final product. To fully take advantage of curcumin’s therapeutic properties, you’ll also need to make sure it is well absorbed. Curcumin is widely available in supplement form, but relatively high doses are required to achieve its anti-cancer effects, and curcumin is generally not absorbed that well. Typical anti-cancer doses are up to three grams of bioavailable curcumin extract, three to four times daily, and this is difficult to achieve using standard curcumin powders. After boiling it for 10 minutes, you will have created a 12% solution and you can drink this once it has cooled down. The curcumin will gradually fall out of the solution over time and in about six hours it will be a 6% solution, so it is best to drink the water within four hours. It does have a woody taste, but this is done more for therapeutic benefits than flavor. One caution: curcumin is a very potent yellow pigment and can permanently discolor surfaces if you aren’t careful. To avoid “yellow kitchen syndrome,” I recommend you perform any mixing under the hood of your stove with the blower on to make sure no powder gets into your kitchen. You can also use turmeric liberally in your cooking; it has an earthy, peppery flavor. Choose a pure turmeric powder, rather than a curry powder, as at least one study has found that curry powders tend to contain very little curcumin. I was told that turmeric may be the reason that there no cases of Alzheimer’s in India. This is a list of other health benefits of Turmeric. I have seen the root sold at Whole Foods and was told that you just grate the turmeric over your food. 2. Is a natural liver detoxifier. 3. May prevent and slow the progression of Alzheimer’s disease by removing amyloyd plaque buildup in the brain. 4. Is a natural painkiller and cox-2 inhibitor. 5. 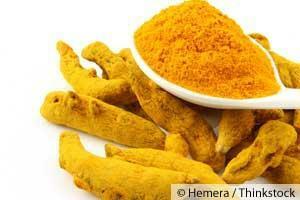 Turmeric may help maintain remission in people with ulcerative colitis. 6. When researchers gave laboratory animals with diabetes turmeric, their blood sugar levels dropped, as did their blood cholesterol levels. 7. Reduces the risk of childhood leukemia. Because bromelain increases the absorption and anti-inflammatory effects of curcumin, it is often combined with turmeric products.